Born in Baltimore in 1971, Clifford Owens studied at The School of the Art Institute of Chicago; Mason Gross School of Visual Arts, Rutgers University, and the Whitney Museum Independent Study Program. He was an artist in residence at The Studio Museum in Harlem (2006) and he attended the Skowhegan School of Painting and Sculpture (2004). He has had solo exhibitions at PS1, New York (2011-2012) and the Contemporary Arts Museum Houston (2011). 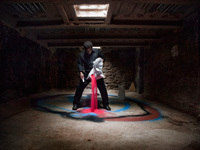 His work has been included in important museum group exhibitions including, Radical Presence: Black Performance in Contemporary Art, Contemporary Arts Museum Houston (2012); Deliverance, Atlanta Contemporary Art Center (2012); Greater New York 2005, Museum of Modern Art PS1, New York (2005), and Freestyle, The Studio Museum in Harlem (2001). Owens has also received grants including: Art Matters; Louis Tiffany Comfort Award; New York Foundation for the Arts Fellowship; New York Community Trust; Lambent Foundation and the Rutgers University Ralph Bunche Distinguished Graduate Fellowship. He has lectured widely about his work and he has held visiting artist faculty positions at The School of the Art Institute of Chicago, The Cooper Union for the Advancement of Science and Art; Yale University and the University of North Carolina, Chapel Hill. The 2012 jury consisted of Franklin Sirmans, Chief Curator of Contemporary Art, Los Angeles County Museum of Art; Helen Molesworth, Chief Curator, The Institute of Contemporary Art/Boston; Amy Adler, artist & instructor; and Dave McKenzie, artist.